Timber may be attacked by many species of wood-rotting fungi, the most widespread in Britain being the True Dry Rot Fungus, Serpula lacrymans. When spores from this fungi settle on damp wood they germinate and develop fine, thread-like filaments called hyphae. Each hypha releases enzymes, which break down wood cells, causing loss of timber strength. 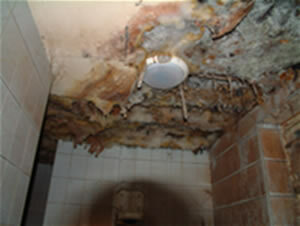 Fungi cannot attack wood at or below about 20% moisture content so decay does not occur unless dampness in buildings arises through poor design or building faults. Dry rot is the most serious type of timber decay in buildings because it can cause rot at a lower moisture content than wet rot fungi and it has the ability to grow through damp masonry and brickwork, and behind plaster. It can therefore spread rapidly through a building, making treatment both complicated and expensive. Dry rot has been a problem in wooden structures for centuries, with some of the earliest documented accounts coming from the Royal Navy of James I in the early seventeenth century. Since then it has moved on from ships to buildings and is now found throughout Britain. It is most prevalent in the north and west of the country and in buildings constructed before the Second World War. Timber is scarred with deep cracks across the grain, becomes light in weight and crumbles easily between fingers.